I grew up without a father for most of my life, but I’ve always had several father figures. There were many to be found within the church I grew up with in Singapore, and God has this wonderful way of providing different ones at each stage of my life. My children are deeply loved by their daddy, but they are also very blessed to grow up around other men of character. On Sunday, anticipating a mini milestone, I took my camera along so I could introduce you to some of the men in Atticus’s life. Arddun, for reasons only her young heart knows, refers to Liz as Aunty Liz but to Raymond as Mr. Ray. Even as a baby, Arddun has never been afraid of his big bushy beard and loud, hearty laugh. I still have fond memories of Arddun reaching out tentatively to pat his bristly chin like it were a curiosity. He may look a very little bit like Gimli from LOTR (or a garden gnome, depending on beard length) and in many ways, he can be just as courageous in fighting for what is right. Always generous, always opinionated, deeply in love with God, Raymond is a teddy bear. Before children, I was never one of those at church who would scan the room for cuddly babies. 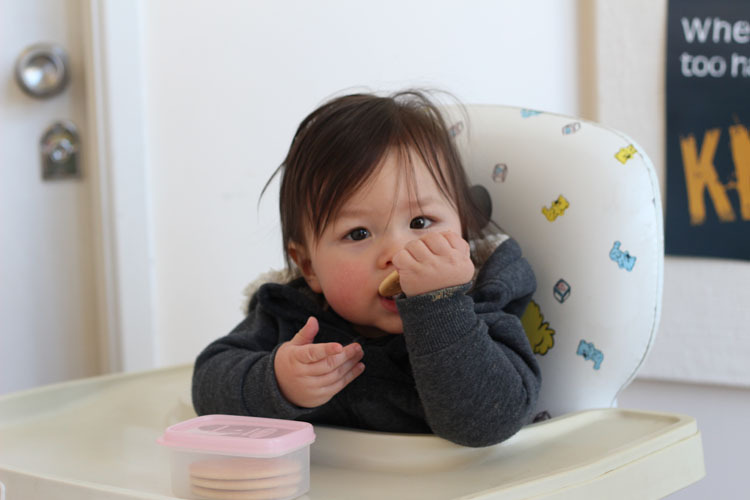 And on looking back, I wish I had been because at the very least, I could have provided something that many mothers of young babies are always thankful for – a bit of reprieve from baby, just so they can sit down for 5 minutes with a hot cup of tea for a change. Peter is another gentle man in Atticus’s life. 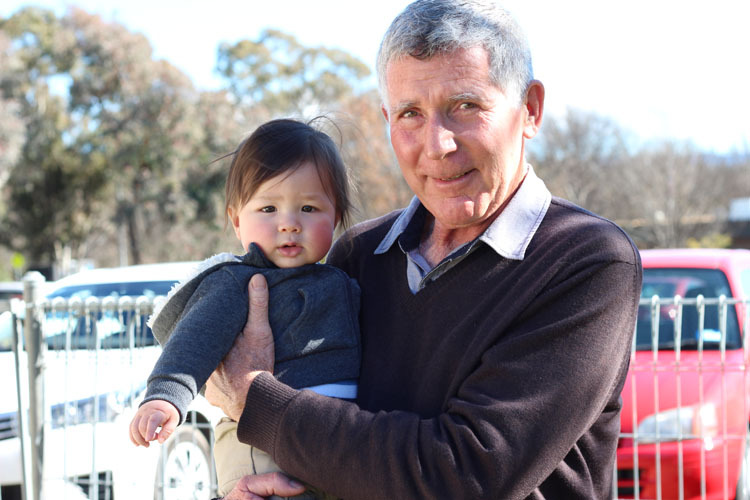 He just loves children, and Atticus has been a great and ever-willing beneficiary of his cuddles and walks around the room during our Sunday morning teas. I love watching someone else light up when they see a child of mine. 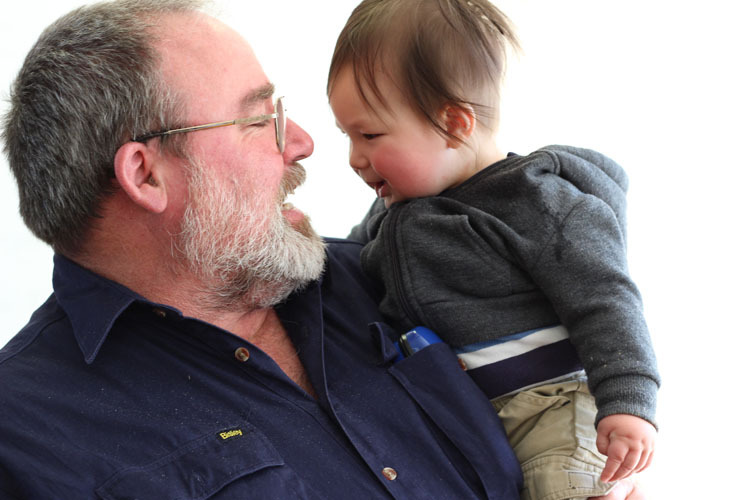 Mark has three children of his own, two of whom Arddun loves playing with on Sundays. Miles (the youngest), I’m eyeing off as a playmate for Atticus in the years to come. 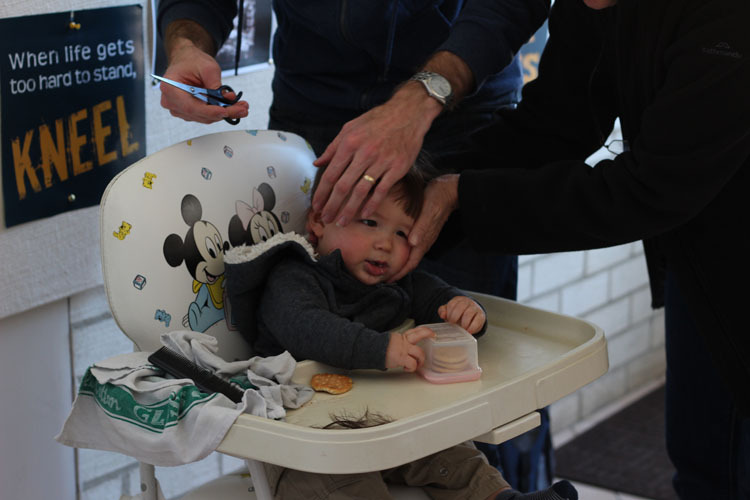 Being a father of two boys has also called on some resourcefulness when it comes to haircuts. 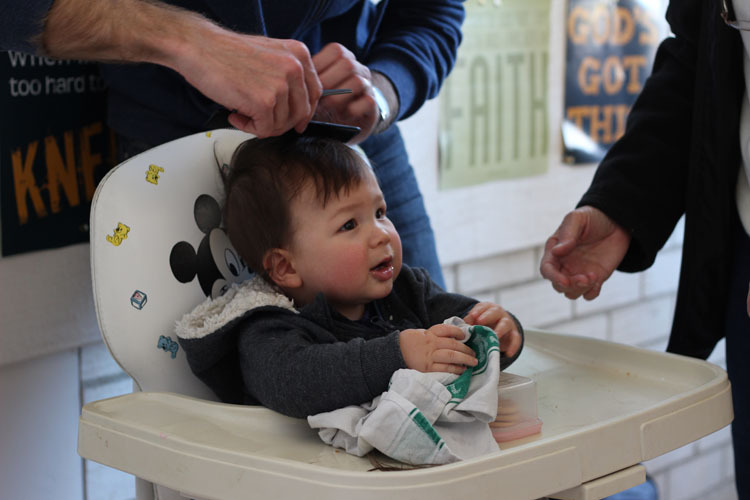 Thanks to YouTube, Mark has learnt to cut his own boys’ hair. And with Atticus’s own wispy baby strands now falling over his eyes, I’d called on Mark to exercise some YouTube hair-cutting wizardry. 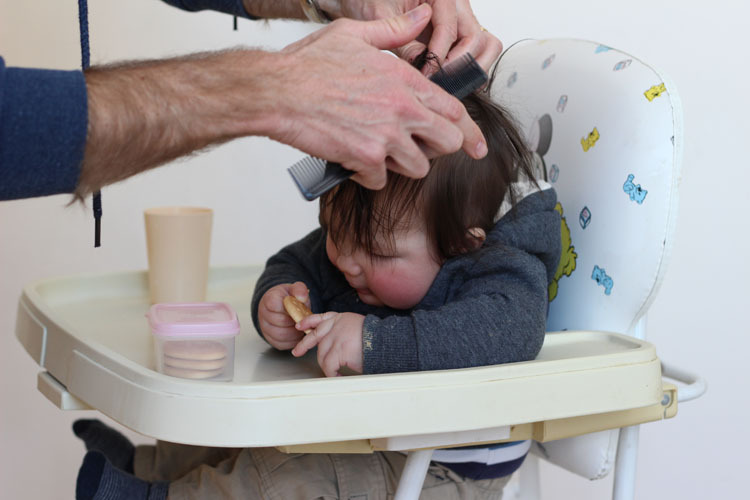 Arrowroot biscuits, a fabulous distraction for a first-ever haircut! A handsome result. 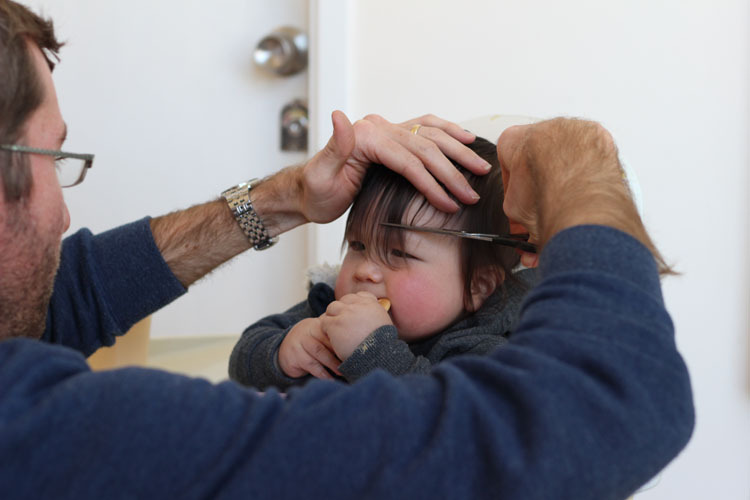 Thank you, Uncle Mark, for taming my unruly baby locks! Can you YouTube how to build a cubby house next? Okay, no more awkward photos. I promise. It’s been a while since I’ve blogged about what I’m thankful for. I used to take a breather every day at 3.00pm and again at 11:15pm to take stock of how my day is going over a hot cup of tea. One of the things I used to do at both those stops was to reflect on the big and little things I was grateful for. Free parking, for instance. New job. That sort of big and little. If I paid enough attention to what was going on, I could even mark the moment with a photo. That habit had, sadly, shrivelled up in the wake of our new and more hectic home routine, what with Arddun’s preschool and Atticus as the newest kid on the block. Now that we have more of a routine going, I’m hoping to put some Mindfulness stops back in my day. Like a muscle that’s fallen into disuse (see Velle’s Abs for further reference), identifying and celebrating things to be grateful for takes practice and doesn’t come as easily as one would think. So in coming back to this Thursday meditation, I struggled a teeny bit before the following came to me. 1. I’m thankful Arddun and Atticus have each other. We had Mandarin playgroup again today, and the three of us had rocked up extra early. 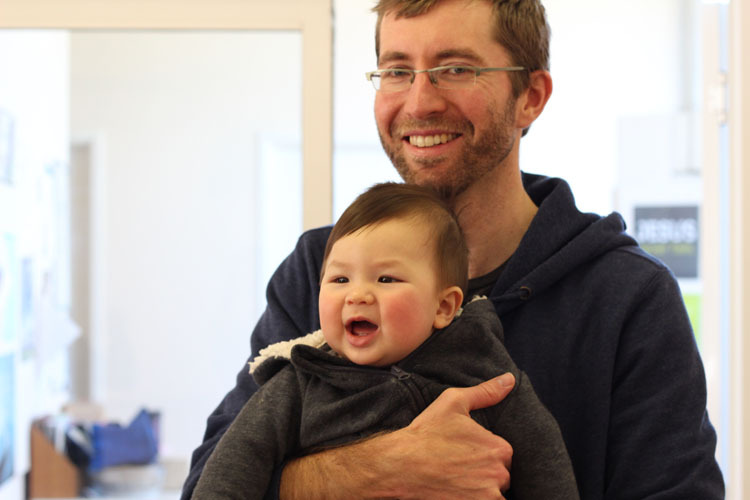 The playgroup is held in a children’s gym at the community health centre, so Atticus soon found himself in a cheerful corner of the room surrounded by age-appropriate toys. He was rapt enough that I could sneak over to the kitchenette on the other side of the room to grab a tea and bikkie. And then I heard it. Volley after volley of that unmistakable belly-laugh. Lately, Arddun has made it her mission to make her brother laugh. The moment she leaves her bedroom in the morning, she makes a beeline for her brother. She does everything from fart sounds (already a hit with the boy) and tickles, to bray-laughing like a donkey and general slapstick. I didn’t have to look up from my tea to guess what was going on back at Atticus’s playmat. His big sister had settled herself down beside him and was jiggling the levers and bells on the toy in front of him to get a reaction. Another mother who attends the playgroup sidled up next to me and marvelled at how wonderfully they play together. Giving Arddun a sibling was a big part of why we had Atticus. 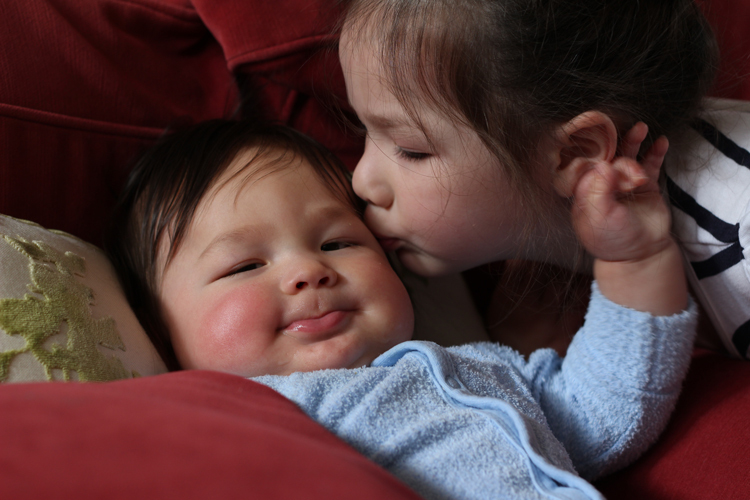 But making a loving, gentle and kind big sister out of Arddun has turned out to be a wonderful blessing for Atticus. Yes, yes… I am adored. Atticus and I went to the Canberra Centre yesterday to catch up with some of my old colleagues for coffee, and to get some errands done. About two minutes before said coffee-date, however, I realised that I had left my wallet at home. I wasn’t too panicked – the ATM machines lately have this feature where you can retrieve cash without using your card. I was also going to try and get some cash at the bank, although it wasn’t until one of my colleagues pointed out that I would need my ATM card for that, that I blanched. Oh dear. I had parked my car within the Centre, and there was no way to pay to get it out. I still needed to do my errands. What now? Turns out, banks understand. In fact, it seems to be such a common occurrence that the teller could finish all my sentences. Less than two minutes later, I was out of there with enough cash to pay for parking AND get what I needed from Officeworks. 3. We have a slab! After a lot of drama and rain and waiting and more rain and banks and then finally losing our tempers, our house has both slabs. It feels like we’ve gotten over a hump in the project. It hasn’t been a straightforward process, and it’s also turned out to be a complicated build… but at least we have a nice view. 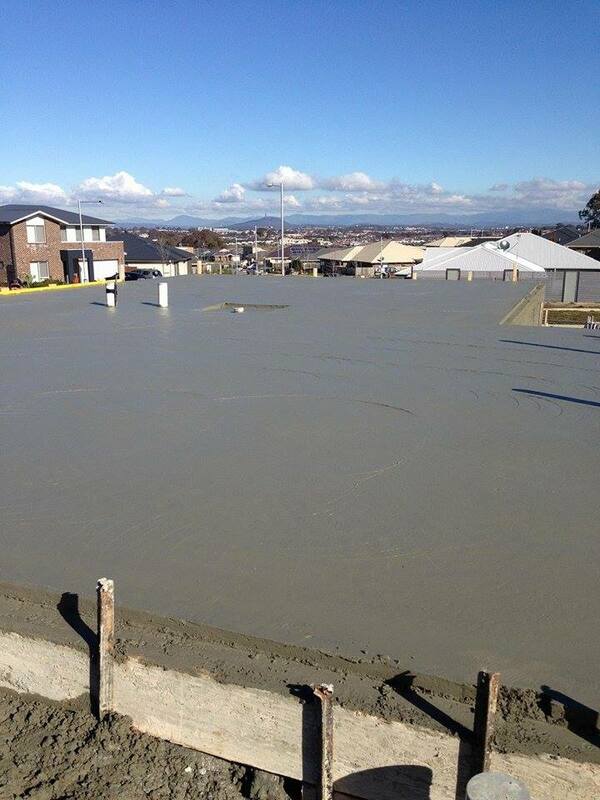 Never thought I’d be so happy to see so much laid concrete. Which is a happy coincidence, because Thursdays are also when I blog about what I’m thankful for. And while I usually try to keep it to three main things, I haven’t been able to stop at that magical number lately. And you know what? This little girl, from the second hour since her day began, didn’t complain a single time. I was so proud of her. These kind of days happen more often than I give her credit for, but perhaps I sat up and noticed this time because we had her Nanna’s company. And as much as I know that part of it is Arddun’s natural temperament and part of it is consistent messaging from Tony and I… I’m just so thankful she has a teachable heart. I have received so many boy clothes that Boy Blob’s entire wardrobe is settled for 2015. This, of course, has not stopped me buying the occasional to-die-for outfit for my little man – but the fact remains that the entire half of Tony’s tallboy reserved for Boy Blob’s things is now almost full. Sarah V came by tonight to hand-deliver my Norwex things… and she has been carting around boxes of boy clothes from size 000 for a while, so when I get the space and chance to go through them, I can. And now she’s offered to wash them for me. Seriously! And it’s not just clothes. If I were to just whimper in passing about perhaps needing something, someone invariably rushes back with an answer. It’s probably why I’ve been less organised with baby prep this time around. Help seems available every which way I turn. I’m so thankful for this community. 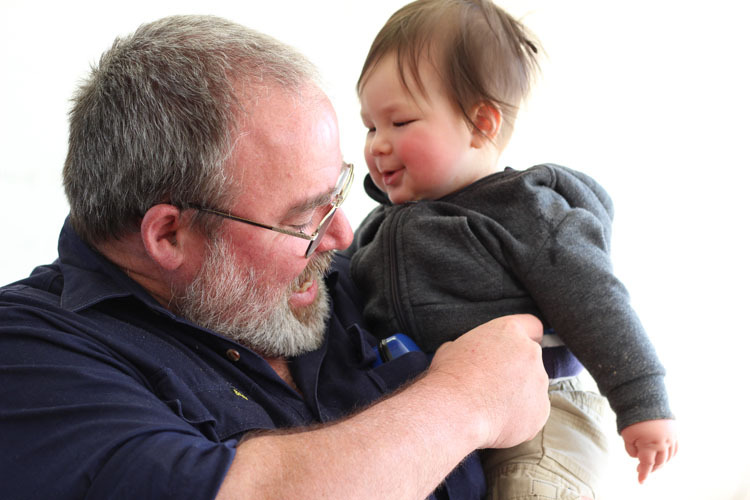 Have I ever mentioned how Canberra, for the most part, loves young families? Until I started carting Arddun around when she was a baby, I never got so much as a cursory glance. No one would ever think to strike up a conversation with me randomly. Once I started carrying a baby that was obviously mine? BAM – passing smiles, offers to grab things from shelves, people unpacking my shopping trolley at the conveyor belt while I’m queueing, passing me compliments and encouragement, the works. I was no longer invisible. 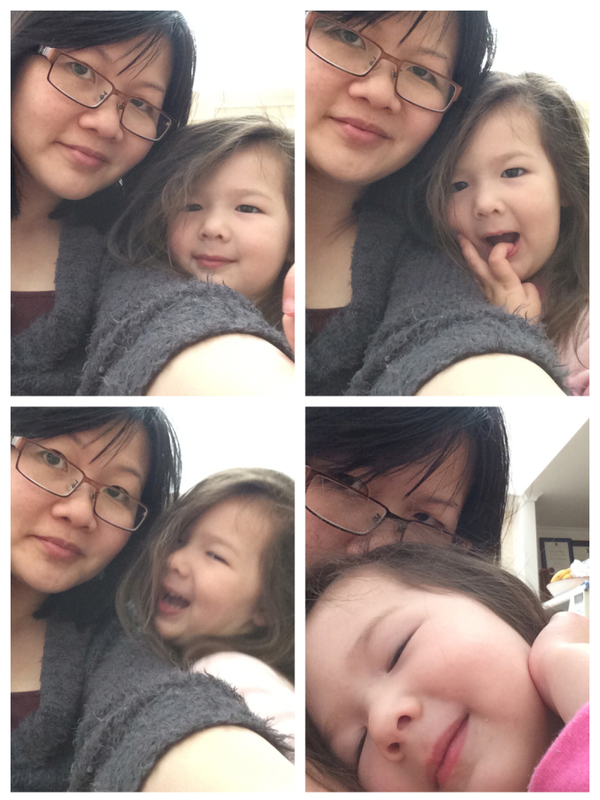 I now had status – I am a Mother. Last Friday was freakishly hot for Spring – a scorching, dusty and windy 35°C, real skin-cancer inducing weather. And while waddling around Garema place and Canberra Centre, I had total strangers coming up to me and asking if I was alright, and if I was keeping myself hydrated. I mean, it’s no secret that pregnant women have an inbuilt radiator behind their belly buttons, but that level of sympathy or empathy blew me away, frankly. Last week, I alluded to the frustration that we had been facing for the better part of our month. Emotional and financial interests spread across two continents can be hard, hard work. Throw in the complications of a home build and a newborn Coming Soon to a Bassinet Beside our Bed, and it’s enough to get a little angsty about life — a reaction we were working hard to avoid because we are grateful overall… but it made us feel anxious now and then. The alternative was for me to travel alone. And that was an even more difficult option for me to swallow. Meanwhile, two professionals on two different continents were beavering away in the background to find a solution that other institutions weren’t interested or able to pursue. And this evening, I was finally given the word that I would NOT have to make this crazy dash, perhaps with newborn in tow. And that, my friends, is something that we are very thankful for. So for those of you who have been praying… thank you. Tony and I both had a tough day today. Actually, it’s been a stressful week which seems to have culminated this afternoon. His is mostly work-related, with borrowed stress from what I’m dealing with. And I guess you can say vice versa for me. Apart from the obvious impending birth of Boy Blob, I’ve lately had to deal with yet another tendril of my mum’s passing. My aunt – after The Cuz’s death four years ago – had warned me about Estate stuff. These things can take months, sometimes even years to work through. Even if there aren’t any assets to speak of, it can take upward of six months. It gets compounded when your past and future are spread across two continents. I was intending to blog tonight about other things I have been thankful for, but I’m only just calming down after an afternoon of frustration that had ended with a depressing answer that will cost us money, time, and further complication. And tomorrow, I’ll have to start the fishing expedition for new answers. More visits to banks. More calls, potentially, to lawyers. More waiting, more explaining. More patience needed as I wait for the other party to grapple with the extent of my ask, and then flounder around for answers. And then sitting down and trying to work out the wisest path forward. Except now, the optimism has well and truly waned and I will no longer trust the first answer I get. Because part of my learning curve has included doubting the accuracy of the first assertion, and then nudging and nudging and nudging until someone higher up the food chain gives the answer I was asking for, but was desperately hoping against. 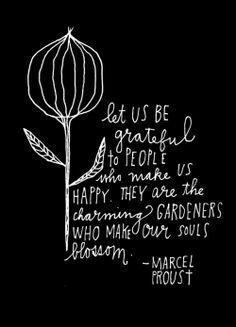 Still, they say that gratitude helps us deal with adversity and lowers blood pressure — two things I could do with right now. And so at the risk of sounding rather rama ding dong about this current trial, here’s me, trying to be gracious about Today. I’m thankful, first of all, for VoIP. Because without VoIP, international calls would be hugely expensive. I spent two solid hours on the phone to various parties in Singapore this afternoon and it had cost me less than $5. I cannot imagine doing what I’ve been trying to do in the limited time I have left (remember: IMPENDING BIRTH!) back in the dim, dark days before VoIP or worse, when you could only write letters and wait for a ship. Eeeuch. I’m thankful for DVD players. Judge me if you must, but I had to plonk Arddun in front of the TV this afternoon and make her promise only to call on me when absolutely necessary. I made the mistake of putting on The Incredibles, which has rather exciting action sequences at times, so she took the opportunity to burst into my room and yell, “I THINK I’M A BIT SCARED, MUMMY!” (She wasn’t. She loves it, and usually runs around the kitchen island pretending to be Dash and Violet getting chased.) And then there was that fifteen minutes, when she stood outside my door asking politely if she could sit on my lap so we could watch together… which then slowly snowballed into a whinge when the polite route didn’t work… until I had to interrupt the bank lady on the phone, get off my seat, throw open the door and wrestle with my stress and frustration as I told her to go back to the couch and watch without me. I don’t think I did a great job with the wrestling because her eyes grew wide and hurt, and then she didn’t bug me again. Did I have heaps of Mummy guilt after? Oh you betcha. But I’m thankful that my girl doesn’t hold a grudge either. Whether I’ve scarred her for life remains to be seen. Because then, I could call heaps more people. 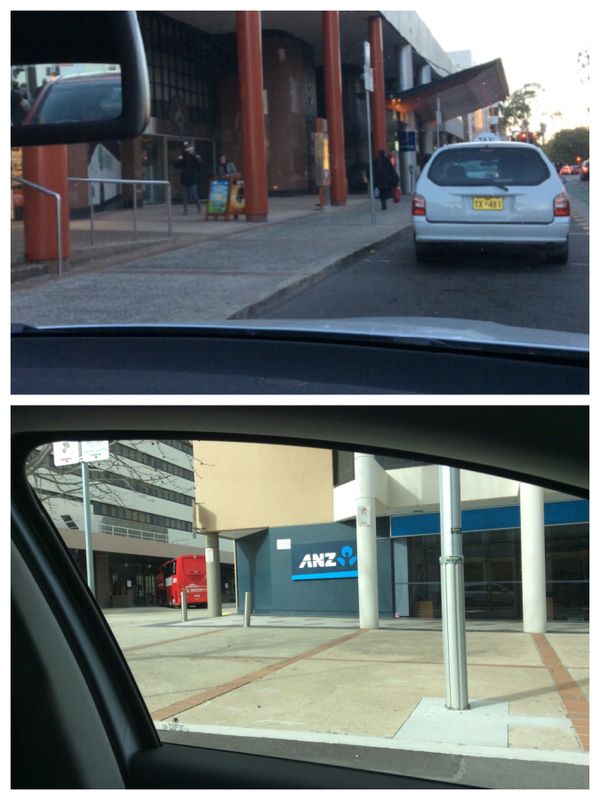 Banks, as you know, close early – so being able to time my calls across two time zones worked in my favour. It also gave the parties in Singapore enough time to consult their colleagues and then call me back, so I didn’t have to wait 12 hours for the business day to begin again. Or for them to forget me. Which is an ironic thing to say, because one of the last phone calls I received this evening told me the opposite – that I had only one option, and it was going to be expensive and difficult to execute with a new baby latched to me. And yet, at least we have the means to exercise that option. Yes, we lose money in the process and a bit of sanity, but at least the answer wasn’t No… just Yes, Using The Most Inconvenient Means Possible Because We Only SAY We Think Global, But We Really Only Act Local. I’m thankful I’m not working. Not in the sense of sitting at the office, beholden to a paymaster. I’m home, I can make these calls, I can sit and plan. And even though I’m toddler wrangling at the same time (and feeling like I’m doing a real half-baked job of it at present), it would have been nigh impossible — or hugely unfair to my employer — if I had to do all this while earning a wage. I’m thankful for Ken Lee. As mother, Christian, woman, girl, and wife.